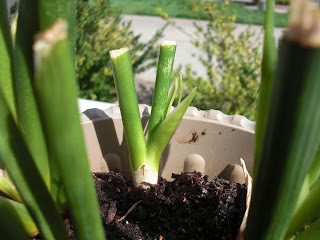 Eats n Feats: Plant Rescue!! Poor, poor, pitiful plant. It actually needs to be rescued from me, not by me!! This plant is a descendant of a trio that I received when my girls were born almost 29 years ago. Those three little plants went through repottings and enough generations to supply a greenhouse. Sadly this and one healthy plant that was adopted out to my mother are all that remain. The only reason this one is still alive is because my good friend G made sure it was watered when we were out RVing for 5 months last season. Of course it hadn't been watered much since and I felt bad about pushing that responsibility on G again, so I decided to bring it with us for this RVing season. This is the first time it has seen the sun in years as it was in my windowless condo bathroom. 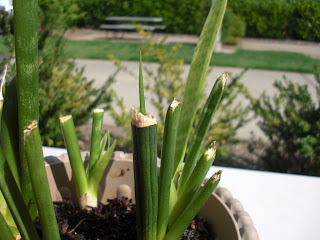 It had gotten quite scraggly so I gave it a severe haircut just before we left. Notice the signs of new life - maybe there is hope yet. My only fear is that I will leave it sitting on a picnic table in some random RV park. To be continued . . . . . Hilarous!! What is the name of this plant? Isn't it "mother-in-law" or something family related? Good pics, though. I will remind you often about your plant and to water it. I love the haircut! 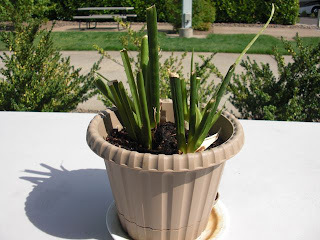 Just think, if you can keep this plant alive while rving, then it will be time to get a dog! !